If you walk the beaches of Montauk, Long Island, when the blues or the stripers run, there is an excellent chance that you will cross tire paths with my friend Fred. His is the beige truck with an untold number of rods attached to it, and the big white Igloo with a "Meatball" sticker strapped to its grill. His son Dan might also be in evidence, or his brother Frank and his daughter Gina. The Abatemarcos are a loving, tightly knit family of very serious fishermen. This is where they fish. And, for a while last weekend, so did I.
Fred and his wife Natalie (the only Abatemarco I have not witnessed carrying a fishing rod) go through a lot of what Fred calls "protein." And so they are always scouting new ways to prepare it. After a three-hour round of fishing on Saturday my associate went about concocting a new preparation for our hosts, a lovely "Bluefish Scancanesca" (don't ask) that pleased 10 very hungry people at dinner. And so when four fresh pieces of blue got tossed into my cooler for the ride home on Monday morning I took that to mean it was my turn to come up with something that our gracious hosts and their family might enjoy. They'd better. Because it's got their name on it. Season both sides of the bluefish (or most any other fish you like) with salt and pepper and marinate in olive oil for around half an hour. In a baking dish covered in olive oil mix together potatoes, red onion, lots of whole garlic cloves and some cherry tomatoes, and season with salt, pepper, fresh rosemary and oregano. Place in an oven preheated to 350 degrees F and cook for around 45 minutes, or until the potatoes are tender. Place the fish atop the cooked vegetables and return to the oven. In about 15 minutes you'll be good to go. And wishing that Fred and his Igloo were within reach. Place the bluefish in a dish or bowl and liberally pour olive oil over it. Salt and pepper the fish and allow to rest in the oil for 30 minutes. Cover the surface of a baking dish with olive oil, add the other ingredients, and place into the oven uncovered. Stir occasionally. When the potatoes are fork tender (around 45 minutes) place the bluefish pieces on top of the vegetables and return to the oven for around 15 minutes. I don't always dress this way when I'm cooking. You'll have to take my word on that. And yet, had you been around my place much last winter, especially at dinner time, odds are good that you witnessed firsthand this preposterous sight. I dread the coming winter. So must the hungry people who share it with me. Face it. It's impossible to pay attention to what's going on in the kitchen when you're continually having to escape to the attic. Dressed up like the Hamburglar and battling armies of wild beasts. I'm afraid you will need to accept my word on this as well. Minutes before this frame was shot, on a very snowy evening last January, I was two flights down, standing at the stovetop in a warm kitchen, chatting with friends and tending to a veal breast stuffed with sausage and pine nuts and fresh herbs. On the counter that serves as my pasta-making station rested a batch of freshly cut pappardelle that I had just prepared. On the turntable (yes, I still have one) Tony "Don't-Call-Me-Norman" Perkins was wrapping up the A Side from his 1958 LP "Long Ago and Far Away," with a respectable rendition of "On a Rainy Afternoon." Anticipating an imminent vinyl flip, I grabbed my wine glass and headed to the living room. There, Otis the Wonder Dog napped near the fire, dreaming (I'd imagine) of the Parmigiano-Reggiano he would surely be gifted once dinner time came around. An all around lovely evening going on here at La Casa di Polpetta, don't you think? Which makes us both wrong. Squirrels—flying ones—are after me. Have been for years now. They live in my house, wreck my property and frequently interrupt my slumber. To fight them I have broken laws I did not know existed, risked serious harm to myself and to others, and skipped out on kitchen duties when they were most crucially required. Go ahead and be disappointed in me if you want. I don't care. 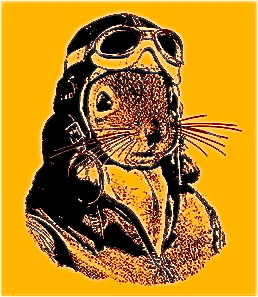 You probably think flying squirrels are cute. Try living with them. Then tell me how cute you think they are. I should have gotten the hell out of this house years ago, when the Pteromyini (that's science speak for the squatters in my attic) first arrived. The kitchen wasn't nearly as workable or enjoyable as it is today. I hadn't converted the stovetop to gas yet, or redone the countertops. Even the wall oven was a piece of crap. Who'd miss it? Instead I had to go and meet a man named David Sparks. Sparks is a wildlife expert in Southern Maine. Should you or a loved one require wildlife "rehabilitation," or "nuisance relocation" expertise, or just a fun-filled birthday party for a bunch of 4-year-olds, Dave is your man. His shop is called—are you ready for this?—Sparks Ark. For real. Exploring the attic and crawl spaces with Sparks did a complete kill on my appetite the day we first met, possibly a decade ago now. I remember clearly having my eye on the leftover pork with clams (a Portuguese favorite) from the night before, thinking it would make a fine lunch. But Sparks showed up in his truck just before noon. When he left, around an hour and way too much "evidence of infestation-gathering" later, I was off to the showers, not the refrigerator. I don't think I ate for the rest of the day. I'll be merciful and spare you the details. You're welcome. Anyhow, back to that snowy winter night last year. No sooner did I lift the stylus from the Tony Perkins LP than my attic tenants' presence became known. I knew by the sound that they were not running roughshod over the fiberglass insulation; clearly the Havahart traps had been tripped while the music was playing. Somewhere above me was one or more creatures lured into "humane" animal traps by Snickers bars, peanut butter, and a Meatball who could not bear dispensing more severe punishment on living things guilty only of needing a warm place to stay after daylight ended. As it happens, two of the four deployed traps were, shall we say, with squirrel. Which meant that I needed to, A) Leave cooking the rest of the meal to others and, B) Commence to unlawfully transporting live creatures to a new home in "another municipality" while driving in dangerous snow-and-ice conditions, and in a hungry and irritable state. See, you can't just carry these traps a few blocks and release what's inside them. Not even close. Some say a successful "wildlife relocation" (meaning the critters won't find their way back to the place where their joy ride began) requires going a 50-mile distance away. And not just any meatball is allowed to transport wildlife across town lines; it's actually against the law to do it. And you thought it was pretty easy being me. I did not drive 50 miles from my kitchen that evening, or the many other evenings just like it through these years. I'll need to be evasive on details here, but suffice to say that a wide river provides man many opportunities. Traveling, say, a bridge that goes over such a river could be a useful exercise for a man in my position, if you catch my drift. Particularly if on the other side there is a cold, dark place where freight trains travel slowly and precious few witnesses (er, citizens) roam. Translation: I drop the suckers off on the side of the river where I (and my kitchen) ain't. And so one night this winter, while you are cooking something fabulous in your fragrant kitchen, surrounded by loving family and dear and devoted friends, think of your pal in the wilds of Maine, four-wheeling through snow over icy roads and bridges, an outlaw in search of no witnesses to his crime. Just try and drop the bandana from the image, okay. 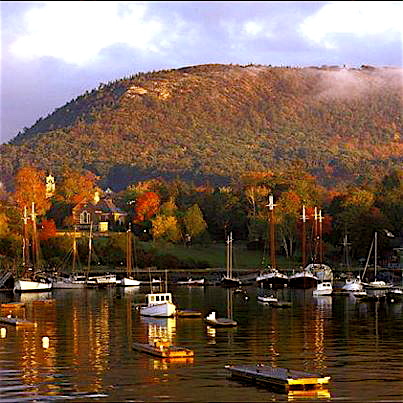 Columbus Day weekend wasn't the best time to enjoy the fall foliage in Southern Maine, and so I answered the usual batch of emails from would-be seasonal visitors by suggesting they hold off just a bit if they possibly could. Well, peak colors are looking like a good bet this coming weekend, and so that's when I'd start thinking about getting up here. Urban by Maine standards, Portland isn't exactly a primo place to look at the changing leaves, but the surrounding areas sure are. My advice is to peep around the town's periphery but save the eating out for right here. 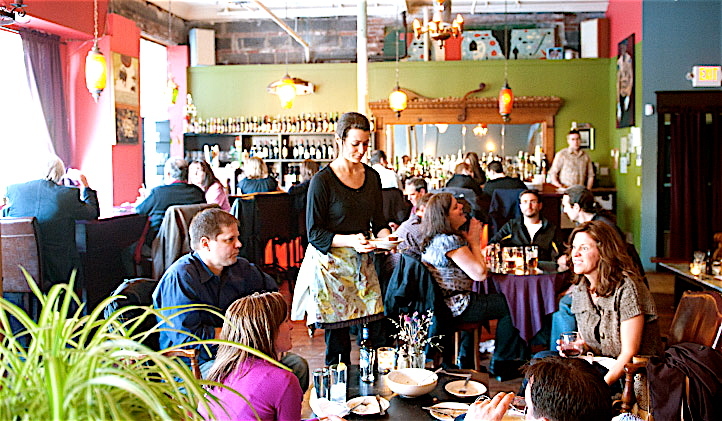 Last year I listed a bunch of the best places to eat in Portland. A couple are no longer open (the Porthole and District), but all the others still are. This time around there are three new places that weren't open last year, plus three others that I'd neglected to get around to. You can't go wrong with a single one. This is by far the coolest new place to open in town for quite a while. 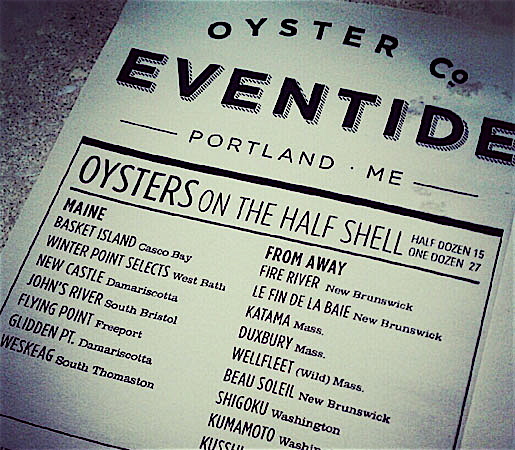 Eventide's oyster selection is the best you'll find in these parts. Not only is the quality top notch, but the shuckers know what they're doing. Every oyster I've had here was clean and cold, the way they're supposed to be. And there's plenty of other good stuff to be had. Definitely go for the lobster roll. It's served in a soft, Chinese-style steamed bun and it's fab. The roll comes with a choice of toppings, but I'd go with the brown butter here (not the Hollandaise). Chowders and stews are prepared to order, very tasty, and accompanied by these tiny biscuits that I could eat all day long. 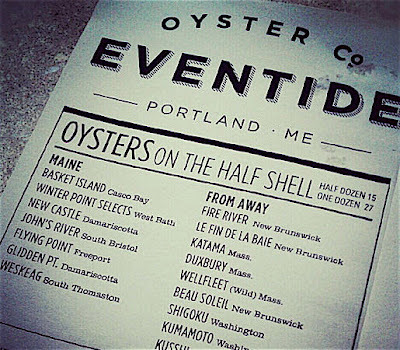 Eventide is not a seafood-only restaurant. They do some nice things with pork belly, for instance. This is a small place, with mostly barstool seating, and it can be a little hard to get into at dinner. Lunch is the safer play here, but a very nice lunch it will be. You'd never guess by its name, but Local 188 is Spanish-influenced by way of Maine, thanks to the kitchen's locavore sourcing philosophy. Always bustling, even late at night, this colorful, friendly spot across from Longfellow Square is especially welcoming when the weather gets cooler. You can hang out and eat in a lot of different places at Local, all in one big room: there's a standard dining area, a hoppin' bar, a cocktail lounge with comfy couches and tables, and—my favorite—a counter in front of the completely open kitchen. Housemade charcuterie, paella, and the unusual specials are always a good bet here, and the wine list is interesting and reasonably priced. A rustic Greek taverna this ain't. 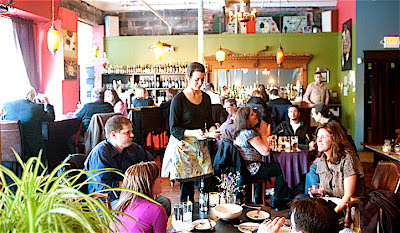 Emilitsa is one of Portland's most grownup dining rooms, in the sense of polished surroundings, elegant food, and attentive service. It's also a great place for quiet conversation, romantic or otherwise. The food at Emilitsa is refined but simple, in the traditional Greek manner, starring classics like marinated lamb chops, whole grilled dourade and a very nice version of moussaka (my fave). As for wine, don't let the Greek selections throw you. Sure, they're unfamiliar to most Americans, but the staff is accustomed to fielding questions and suggesting pairings. With two locations in Portland—and two in the Boston area—Otto Pizza not only serves great pies but it's also open late (until 11 p.m. on weekdays and 2 a.m. on weekends), a blessing in a town that can roll up the sidewalks dishearteningly early, especially in the winter. Whether you choose the hole-in-the-wall Arts District location or the atmospheric, tin-ceilinged tavern that houses the newer East End outpost, the pizza's the same: thin and crackling of crust and tasty of toppings. Strange as it sounds, the mashed potato, bacon and scallion pizza is amazing, but there's also a creditable Margherita and some two dozen other pies both classic and creative. No salads, no apps, but a good selection of beer and Italian wines served in sensible stemless tumblers keep hands and mouth occupied while you're waiting. It would be hard to find a friendlier or more likable place than Schulte & Herr. It's not much to look at—think clean, well-lit finished basement—but everything to love. The food is homemade down to the delicious rye bread, and the chef-owner has a deft, light touch with German food, which can be heavy in less skillful hands. Whether you come for brunch, lunch or dinner, do not fail to order the wonderful cured salmon with potato pancakes. Sauteed spaetzle is also amazing, comforting yet ethereally delicate, and there's an unusual and delicious gulasch made with local seafood. Being able to bring your own wine or beer is another plus. In fact, my party has even arrived with a shakerful of cocktails to enjoy while considering the menu. The Speckled Ax is about as geeky a coffee place as you are ever apt to encounter. And I love it. The glass siphons standing on the bar make it look like they're making moonshine here, not coffee. And forget having your fix flow from a spout attached to a stainless steel cylinder: they make coffee to order here by pouring water over grinds in a paper cone filter. 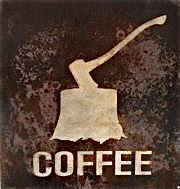 Not only that but your drink will be prepared for you by an earnest coffee lover who really gives a damn. The product they put out here is terrific, but the Ax is worth checking out simply for curiosity's sake.